In the context of debates on (forensic) psychiatry issues pertaining to moral dimensions of (forensic) psychiatric health care are frequently discussed. These debates invite reflection on the question whether forensic practitioners have a role in stimulating patients’ moral development and moral growth in the context of forensic psychiatric and psychological treatment and care. We conducted a qualitative study to examine to what extent forensic practitioners consider moral development and moral growth to be a part of their current professional practices and to what extent they think that stimulating moral development is a legitimate objective in the context of forensic psychiatric treatment. In addition, we asked how forensic practitioners balance pubic safety and risk management concerns with the interests and wellbeing of the individual patient. 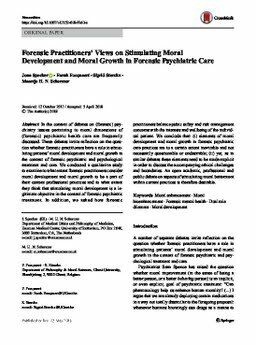 We conclude that: (i) elements of moral development and moral growth in forensic psychiatric care practices are to a certain extent inevitable and not necessarily questionable or undesirable; (ii) yet, as in similar debates these elements need to be made explicit in order to discuss the accompanying ethical challenges and boundaries. An open academic, professional and public debate on aspects of stimulating moral betterment within current practices is therefore desirable.